Colleagues, here is the blog for March 2019, and what a busy month it has been. I'll start by updating you on our annual conference that took place in Edinburgh on 12 and 13 March 2019. The event began with a meeting of all Federation Chairs and Secretaries. They shared the concerns you have raised with them and received an update on matters affecting the force and our officers on a national level. As ever there was plenty to discuss and debate, which I will attempt to summarise later in this post. On Tuesday evening we presented our Awards of Excellence to officers who had saved lives, demonstrated bravery and meticulously investigated crimes. All the award winners had been nominated by you, their colleagues and peers. It is always a very proud moment for me as the Chairman to present the awards. We know that policing is a job like no other and the events of the last year proved that we are prepared to deal with the challenges society throws at us without hesitation or consideration for our own safety. Your unrelenting sense of duty and courageous responses to some very desperate and testing situations makes me proud to be a BTP officer and to represent you. Thank you all for your excellence and professionalism in policing the railways and keeping the public safe. The Awards of Excellence are made possible thanks to the support of Police Mutual, who sponsor the event. So, my final thank you goes to Andy Elkington and the Police Mutual team. Videos were produced to tell each award winner's story and you can find those here. There are two stories we can't share publicly because they are still being investigated but they demonstrate the diverse work of BTP officers. Conference got underway early on Wednesday morning. My speech - which you can read in full here - focussed on the theme for this year's conference which was 'value'. I believe police officers have values but I question whether we are valued in return by Government, police leaders, and the media. I touched on several topics including the funding of BTP (especially our counter terrorism capability), the impact of budget cuts and efficiencies on frontline services, pay/pay reform, assaults on police officers and the criminal justice system. We have received positive feedback and have since heard others raise the question of whether police officers are truly valued. One highlight of the conference was the attendance of the Scottish Cabinet Secretary for Justice, Humza Yousaf MSP. He presented an award at our Awards of Excellence, stopping to speak to numerous officers and guests, and accepted an invitation to respond to my speech, particularly my comments on integration of BTP Scotland. Why was this so important to us as a Federation? Firstly, and most importantly all our BTP colleagues in Scotland need clarity around integration and for the uncertainty to be lifted. Who better to do this than the Cabinet Secretary himself? In his response the Cabinet Secretary told conference that any new proposal needed to be the right solution but, more importantly, the safety and security of the travelling public must not be compromised. He acknowledged the uncertainty felt by our colleagues in Scotland and reiterated the need to achieve a viable solution as soon as possible. 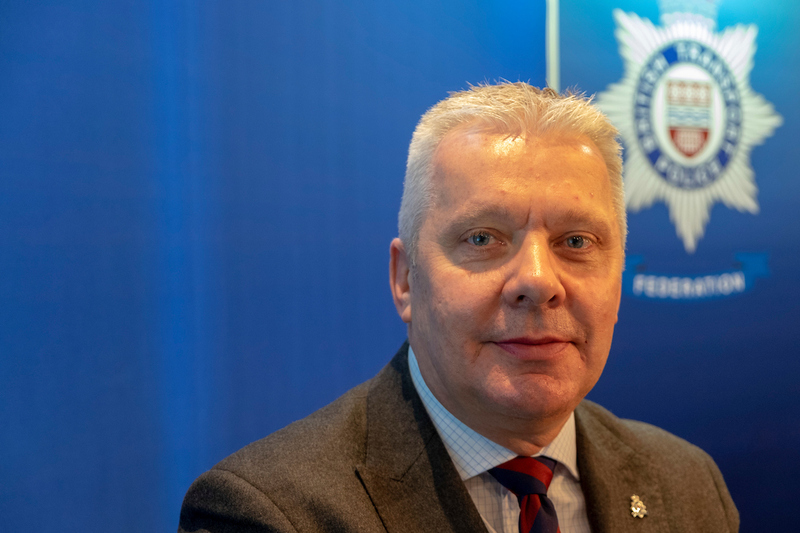 He also confirmed the proposed alternative to integration would require no significant structural changes, pensions and terms and conditions for BTP officers and staff will be unaffected. Mr Yousaf was clear that his focus was on delivering the recommendations of the Smith Commission and he remains committed to the devolution of railway policing. He is open to all options for achieving this and so far nothing has been ruled in or out. He spoke about a significant bedding-in period being required for any new arrangement and that a long term view would only be taken once that arrangement had been thoroughly scrutinised and reviewed. I am very pleased and grateful that Cabinet Secretary attended our conference to update us. He clearly understood the importance of the occasion for our members, and the need to provide clarity. This is in stark contrast to his colleagues in Westminster who not only didn't attend but didn't provide any updates or messages of support in lieu of their attendance. Given this was a conference about whether police officers are valued, the actions of those in Westminster spoke volumes on this occasion. After the speeches there was a question and answer session with DCC Hanstock and the Chair of BTPA Mr Ron Barclay-Smith. They responded to questions on pay, ill health dismissal and Scotland, amongst other matters. This was then followed by guest speakers Professor Becky Milne from Portsmouth University and Charlotte Copeland from Safe Haven. Both shared best practice on officer wellbeing and welfare after traumatic events. These were valuable inputs and hopefully we can encourage the force to put into practice what was being presented to assist our colleagues who deal with trauma day in, day out. The final session was for Federation delegates only. Both the Treasurer and General Secretary gave their reports and several motions and rule changes were debated. If you have received this blog by email, a conference report is attached. If you haven't received that email, please update your contact details by emailing info@btpfed.co.uk and we can send a copy to you. There is a suggestion that TfL has given notice to BTP of their intention to cease funding for 160 officers in London. Given the current climate of increasing violence and terrorism threat level this is something we will challenge. We need to be clear on the facts so am seeking a meeting with TfL to fully understand their position, and what it means for our colleagues. I will also determine what action, if any, is needed from BTPA to provide both our members and the travelling public with reassurance that their safety will not be put at risk. From previous blogs you may be aware that we are encouraging the Force and the Authority to produce a document containing our regulations and terms and conditions. We all have a right to know what governs us and how those regulations impact on pay and conditions. For the last three years we have regularly voiced our view that it is totally unacceptable to have a 'pick and mix' of regulations that are open to interpretation depending on who you speak to and where you are based. One document with one set of rules and regulations will stop this. I am therefore very pleased to report that the Force has finally taken on the challenge and is now in the process of producing such a document. Once it is delivered it will go before the BTPA to be signed off. I hope they will understand the importance it and prioritise it being issued to all. Any further updates will be shared. Darren Townsend, our General Secretary, attended the recent BTPA meeting. The meeting began with an update from the Chief Constable on recent significant events and the excellence response from our colleagues. He also talked about the increase in violent crime, mentioning two recent murder investigations conducted by our detectives in London, resulting in arrests and charges. The lack of a bilateral agreement for the transfer of CARE scheme pensions was acknowledged during the meeting. This is an on-going problem, especially for officers who have transferred to BTP in the last three years and for those on a CARE scheme pension. Currently there is no agreement in place to allow for the transfer of one CARE pension scheme in to another CARE Scheme. BTP/A are currently in discussions with the Home Office, The Treasury, RPMI and the Department for Transport in an attempt to resolve this issue. All officers affected should receive a letter from the Force providing an update the action the Force is taking and what officers should do regarding pension advice. Any updates that we receive will be shared immediately. I had the pleasure of attending the Police Care UK conference in Leeds last week. The focus was on police officer wellbeing and welfare. Both us and BTP are now looking at ways of working more closely with Police Care UK (the charity formerly known as the Police Dependants Trust). Please visit their website where you will find out more about the support available to officers and their families; especially if you are coming up to retirement or being considered for ill health. There is a lot of help available especially around mental health and PTSD. I will be encouraging some of our reps to become Police Care UK champions and helping to signpost colleagues to support. Once I receive more information it will be circulated via our reps. This month I joined our retired officers at the recent NARBTPO AGM. The Chief was also in attendance and again updated the delegates with lot of what I have shared in this blog. I did approach the committee and ask whether any officer who is ill health dismissed could join the NARBTPO as a member despite not being retired through length of service. This received a positive response and the committee will discuss this suggestion further. I believe it important that officers who leave the force through ill health should not feel abandoned and no longer a part of the policing family. Hopefully they will be able to join NARBTPO and remain in contact with colleagues in similar situations. It is right and proper that I mention the sad loss of ex Chief Superintendent Mark Smith. Mark passed away suddenly and his death has impacted on those who worked with him in suicide prevention and served with him when he was a police officer. Mark was a very loyal servant to this force, and it was with regret that I couldn't attend his funeral due to our annual conference. We paid our respects at conference and Mark's family and friends are in our thoughts and our prayers. His is a very sad loss indeed. Mark was a consummate professional, as you all are, and on that note I would again like to thank all of you for your continued hard work and professionalism in policing the railways and keeping the public safe. "Sometimes later becomes never. Do it now."